This isn't going to be a proper blog post. Just a quick share. 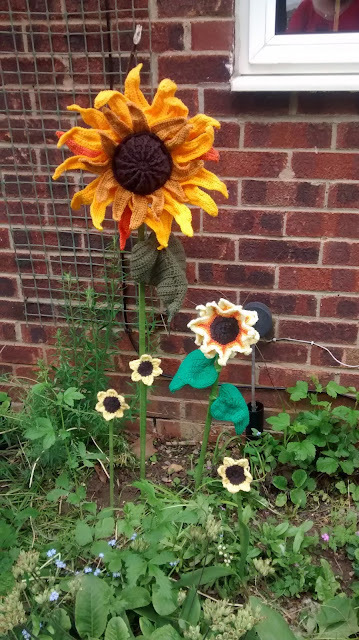 I want to fill the whole garden with crochet flora and fauna. I've set up a Pinterest board to collect patterns and inspiration. Click here to take a look. Mum's experimented with waterproofing sprays and I've got my fingers crossed it's not all going to go soggy. Even though my garden is only the size of a pocket hanky, I think it's going to take me a very long time to finish to Chelsea Gold Medal standard but I'm begging, borrowing and stealing too. I already have a bee and a bird from mum. Awesome idea - such blooming beautiful sunny sunflowers! Hope your flowery patch has many admiring glances! I would love to hear about your waterproofing process. I don't enjoy gardening but I could definitely do this! Thank you for the idea. Not so much a process as a spray. I need to check the name of the spray we're using and I'll update you on its effectiveness once we've had some real rain ... on Friday according to the weather forecast currently.